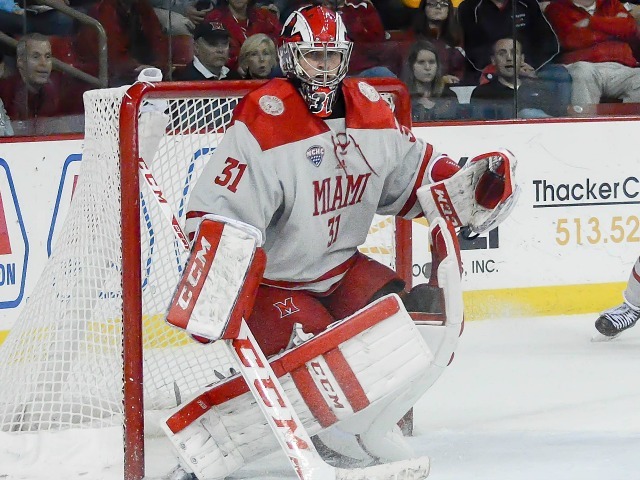 This is basically the mid-point of the Miami hockey season, as the RedHawks are wrapping up a month-long regulation-game break and have 16 of 34 regular-season games remaining in 2017-18. The hard data: MU is sixth in the eight-team NCHC and 8-8-2 overall. But most importantly, the RedHawks are still 17th out of 60 in the PairWise. That’s the position in which the RedHawks have placed themselves with their first-half performance. Certainly better than last January 3, when Miami was 4-8-5 after a 10-game winless streak from Oct. 29-Dec. 9. The RedHawks Version 2016-17 finished 1-12-2 in their final 15 games, and their struggles appeared to bleed into this fall, as they were 2-15-2 in a 19-game stretch through the second week of October. During the 2017 calendar year MU was 12-20-4, a .389 win percentage, but after a 1-3 start to 2017-18, the team is the team is back to .500 for the season and is 4-2-1 in its last seven against mostly ranked teams. Miami has definitely improved this season, and seems to be doing so on a weekly basis. But .500 won’t get the RedHawks back to the NCAAs, even in the ultra-competitive NCHC. They likely need at least a 9-7 record and an opening-round league tournament series win to qualify, so the team development must continue. 1) Cut down quality chances allowed. Opponents are generating fewer than 25 shots per game, but nearly three are going in on average. The RedHawks still leave the slot open too often and don’t always make the opposition pay the price in the crease area. 2) Generate scoring from players not named Green-Melnick-Belpedio-Hutton. Miami presently has two scoring lines – to be generous – and goals have been a rarity from the other two sets of forwards. This was a problem in 2016-17 as well. 3) Goaltending can still improve. Ryan Larkin makes a lot of quality saves and faces a lot of high-percentage chances, but his save percentage of .893 still needs to rise. Neither Chase Munroe nor Grant Valentine have done much to impress behind the first half of this season. 4) More production from the Columbus duo. Carson Meyer and Kiefer Sherwood have just 14 points between them and are both minus-7. Meyer also has 33 penalty minutes, with 25 coming off a major and two 10-minute misconducts taken out of frustration. This duo combined for 64 points in 2016-17. 5) Closing out games. Yeah, like this is a new one. Miami turned a two-goal lead into an overtime loss in its last game of 2017 at Western Michigan. It blew a one-goal edge in Bowling Green before that. Etc. Etc. Posted on January 4, 2018, in 2017-18 and tagged 2017-18 miami redhawks, ryan larkin. Bookmark the permalink. Leave a comment.